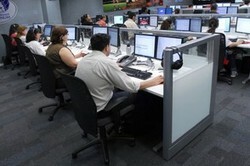 A look at how call centre operators can keep their customers happy. Everyone has at some point been frustrated by a call centre operator who seems determined not to let the caller get the information they want. This creates a bad impression of the company the call centre represents. But by following these few simple rules, call centre operators can go a long way to having happy customers. A good call centre can keep customers happy. For many companies, call centres are the only way they can practically and affordably deal with the number of customers they have seeking information. By their nature, often the call centre operators cannot know everything about a company and how it operates and sometimes they only know the answers to a list of frequently asked questions. This can be frustrating for customers who want a more detailed reply. However, by following these basic rules, call centre operators can go a long way to making the exchange successful for the caller. When answering the phone, start by greeting the caller, with name and company, and asking the nature of the call. Do not start by asking the caller for information. If the screen shows that the caller has been waiting to speak to someone for more than a minute, apologise for the delay. If the customer is paying for the call (that is, it is not a freephone number), then offer to call the customer back rather than let them continue paying for the call. Only ask for security information if it is necessary for the type of call being made. So, for example, if the caller wants to know the balance of their account or how much they owe, then security questions are necessary. If the caller is asking about standard charges for different services, then that is freely available information and there is thus no need to waste the caller’s time by asking security questions. Never put a caller on hold without their permission. Always say something along the lines of: “I need to speak to someone else about this, is it alright for me to put you on hold?” If the caller answers no, then do not put them on hold. If it is taking longer than first thought to get the information the caller wants, do not just leave the caller on hold. Speak to the caller at least once a minute to assure them that you are still on the case and trying to get the information that they want. Give them the option to be called back. Never pretend to know the answer to a customer’s question. Be honest. Say, for example: “I am sorry, I am not sure about that. Would you like me to find out for you?” Don’t just guess an answer and hope that will satisfy the customer. It might work for the call, but once the customer discovers the answer is wrong then it will damage the reputation of the company. If getting the information the customer needs is going to take a long time, offer to call the customer back. Agree with the customer a time suitable to them for the call. Keep to that. Even if the information is still not available, call the customer at the agreed time – punctually – and explain the delay and make a new appointment for a call. If a caller becomes angry, it is because they are not being given the information or service that they want or expect. Try to understand what it is the caller needs and if necessary offer to pass the call on to someone more senior. If a customer has got to the point where they want to speak to a manager, then accept that and put them through. Some callers can be frustrating, but do not see that as their fault. If they have not been given the information they want, do not end the call even if there seems no way forward. It is better to let a colleague try a different approach rather than hanging up. By following these basic rules, call centre operators can go a long way to making the customer feel happier with the service they are receiving. A happy customer is more likely to stay with the company, spend more money with the company and not go looking for alternative suppliers of the goods or services the company is offering.